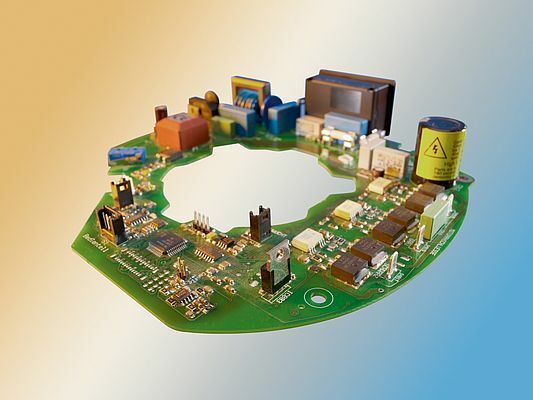 The range of hatronic frequency inverters from Hanning extends from conveyor belts in the industry and vacuum pumps in process engi­neering through to commercial hot air ovens. The frequency inverters are "individual and alterable". Be it round, square or angled, everything is possible, as long as it is technically and economically reasonable. The power control electronics are adapted to the application in terms of design and electronics and the respective installation space. Integrating the control system in the inverter is another option that can lead to an effective solution. Addi­tional electronic components such as device controller, specific control elements or safety functions are also taken into account. If the harmonic standards as per EN 61000-3-2 must be fulfilled for single-phase power supply of up to 240 V, an active Power Factor Correction (PFC) is integrated. The power elements of single-phase and three-phase devices are classified according to power supply and output rating and provide up to 2.2 kW for single phase and up to 4.0 kW for three phase. The use of two independent microcomputers on a module is another option. The first microcomputer handles the drive control, while the second one is available for pro­gramming appliance-specific functions. Both microcomputers use the existing serial ports to communicate. The reciprocal monitoring of both computer systems results in advantages in terms of electrical isolation, self-locking control system and single-fault tolerance. The DrivePAR software allows for a comfortable and quick configuring of all parame­ters of the hatronic frequency inverters.